The main opposition party in Zambia has filed a court petition against the re-election of President Edgar Lungu. The United Party for National Development alleges the poll on 11 August was rigged and wants a recount. Mr Lungu was due to be sworn in next Tuesday after securing 50.35% of the vote, avoiding a second round. But according to Zambia's constitution, any inauguration has to be delayed until the Constitutional Court rules on the case. 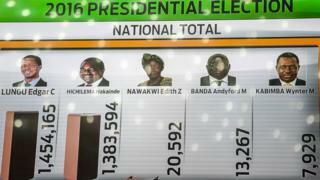 Zambia's election commission has insisted that the poll was free and fair. But it also described the level of political violence ahead of the elections as unprecedented. It was forced to suspend campaigning in the capital, Lusaka, for 10 days because of the unrest. Opposition candidate Hakainde Hichelema, who took 47,6% of the vote, told the BBC's Focus on Africa radio programme that the election was stolen from him and did not reflect the will of the people. "The first respondent did not receive more than 50% of the total votes cast. The voter register was not credible and its non-availability before the elections compromised the transparency of the electoral process," Reuters news agency quotes the petition as saying. The Constitutional Court has two weeks to rule on the petition.